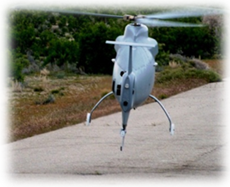 American Unmanned Systems’ Guardian unmanned helicopter UAS provides full use of multiple onboard sensors and payloads resulting in continuous ISR engagement and quick delivery to operational and tactical forces. Unprecedented situational awareness, precision targeting, communications relay delivery for fighting and defeating threats are provided by the American made Guardian unmanned helicopter. 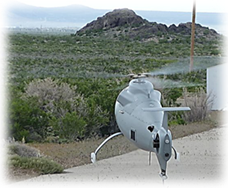 The Guardian provides unmanned-manned teaming and connectivity to reconnaissance, surveillance and target acquisition and communication systems. It further supports multidimensional operations. By its rapid modular mission payload nose exchange - Guardian features an extended effectiveness and flexibility of any ISR architecture. Current Guardian mission payloads include EO/IR sensor, threat analyzing sensors/detector, firefighting, search and rescue. The Guardian unmanned helicopter is made in America and based on an airframe design of the U.S. Naval Research Laboratory. The Guardian is developed for many missions and currently under test and evaluation. Several services are excising a partnership to maximize efforts to defeat threats. With Guardian's Air Vehicle endurance of up to 5 hours, it can quickly locate and accurately detect, identify and track targets. American Unmanned Systems’ Command & Control vehicle system provides complete ground control system assets for the control, command and operation of unmanned systems. Providing the commander and operators with live imaging, communications, real time intelligence in addition to transport of complete unmanned systems, training – the American Unmanned Systems’ Command & Control vehicle system provides a very flexible and ground tactical system to bring the full value and support of unmanned systems..